Toronto's taxis are adding tablets to the dispatch system, changing more than half a century of cabbie culture. Photo by James G, from the Torontoist Flickr pool. This has been taxicab culture since the 1940s: cabbies listen to the radio primarily to pick up clients, but the secondary uses are myriad—they can clue into popular intersections, blow off steam, or chat about hockey. The dispatcher is the mothership, transforming cabs from isolated cells into lively hubs. As long as your radio’s turned up, you’re never really alone. Now, by adding tablets to the mix, that culture will gradually disappear. Mac has been driving cabs for more than five years, and understands tablets’ value. Instead of voices crackling over the speaker, dispatchers will be able to see each car’s position online via GPS, and send drivers on missions individually, using the radio system more selectively, depending on who’s closest. It saves the company money on hiring more dispatchers during busy periods, and creates a more responsive network of drivers who can, theoretically, reach clients faster. Plus, Mac says he can more handily win arguments with backseat drivers who think they know the best routes. 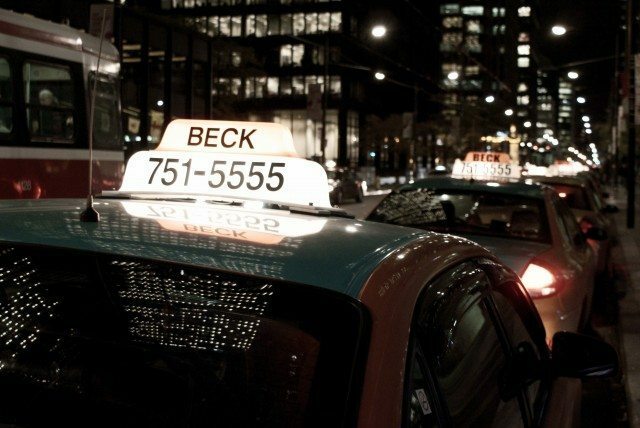 And for Beck—Toronto’s largest cab company, with a fleet of 1,850 vehicles—making things easier is crucial. The virtualization is part of a larger war against Uber, the controversial ride-share app; Beck’s in-car digital overhaul is directly linked to the launch of the their own app late last year. Every major cab company in Toronto is in a transition process to bring the city’s 10,500 cabs into the 21st century. And the loss is truly a game-changer: watch the opening of the National Film Board’s noir-esque 1982 documentary, Taxi! ; the wise-cracking air of buzzing gossip and sports chatter is the definitive taxi ambience. By next year, like in so many other industries, that will be largely replaced by digital silence. CORRECTION: March 10, 7:30 PM This article originally implied that Beck was swapping out radios for tablets entirely. In fact, cab drivers will continue to use radios alongside the digital dispatch system.